To Order, Please Specify Model No. and Color Code. Equipped with all steel ball-bearing drawer slides for increased precision movement and minimal sideplay. Wire pull handles of solid brass with polished chrome finish. 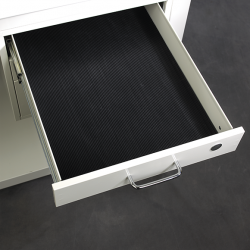 100% full-extension slides provide maximum utility of drawer space. 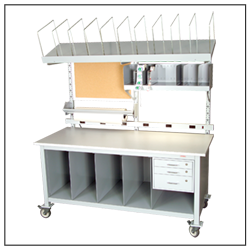 All drawers are housed within a case; drawer cases may be tiered. Optional drawer locks are available. 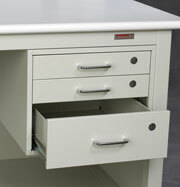 If locks are not ordered, drawers are equipped with chromed dot plugs to allow for lock installation at a later date. 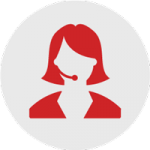 Standard Brackets are recommended for light to medium weight loads. 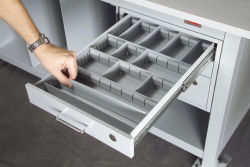 Use Heavy-Duty Brackets for heavier weight loads, or when multiple Drawer Cases are being tiered. Available in Silver Gray Finish Only.